Revolution Slider Error: Slider with alias medtech-buyers not found. Getting in front of physicians and healthcare execs isn’t easy. Medtech buyers are not out of reach, but they do require more than an office visit, note pads, or pens (though these items are rarely turned away). Make an effort to speak directly to their needs, and create a memorable experience. Guarantee physicians understand how your product will help them improve their bottom line. 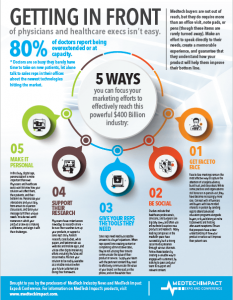 Download 5 Ways You Can Focus Your Marketing Efforts to Effectively Reach Medtech Buyers and capture your share of the Powerful $400 Billion Medical Industry now. Complete the form below to download your free copy. Are you interested in attending or exhibiting at the MedTech Impact Expo & Conference in Las Vegas?